The Mexican Foreign Minister says he’s not ruling out a quick ending to the North American Free Trade Agreement (NAFTA) talks. Reuters says the top Mexican diplomat says progress is being made on several issue-specific tables of the negotiations. The U.S., Canada, and Mexico’s top negotiators were meeting late in the week to continue discussions. The talks have moved slowly for the past eight months and all three countries want to settle the process as quickly as possible. They all want to finish before the Mexican presidential election on July 1. 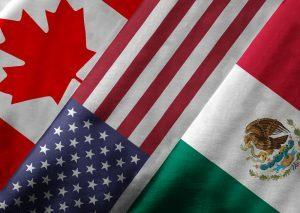 The upbeat Mexican comments are similar in tone to the positive comments from Canadian Prime Minister Justin Trudeau earlier in the week. U.S. President Donald Trump said Thursday that he expects the three nations to have something to announce on the NAFTA negotiations very soon. Some challenges still remain, including the U.S. demand that the North American content of vehicles produced in the NAFTA nations be increased from 62.5 percent to as much as 85 percent. A Mexican source close to the talks told Reuters the U.S. has shown some flexibility in the rules-of-origin discussions, and the three countries are now looking at alternatives.